Thanks for stopping by to share my simple pleasure today. Candy, this is beautiful. I love stopping by your place. Just one look at that GORGEOUS header and I'm hooked. I added you to my sidebar blogroll so I never miss a thing. Thanks for sharing this simple pleasure. 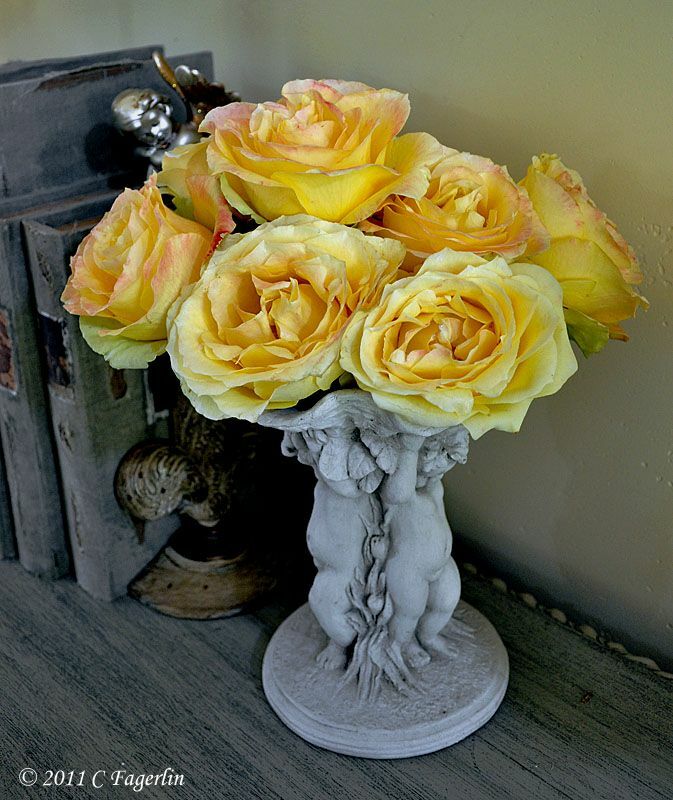 What gorgeous yellow roses you have - they're simply stunning!! Roses and angels go so well together !!! I love your roses they are beautiful !! I adore roses and these are magnificent! Thanks for linking up today. Thank you all for coming y to smell the roses! 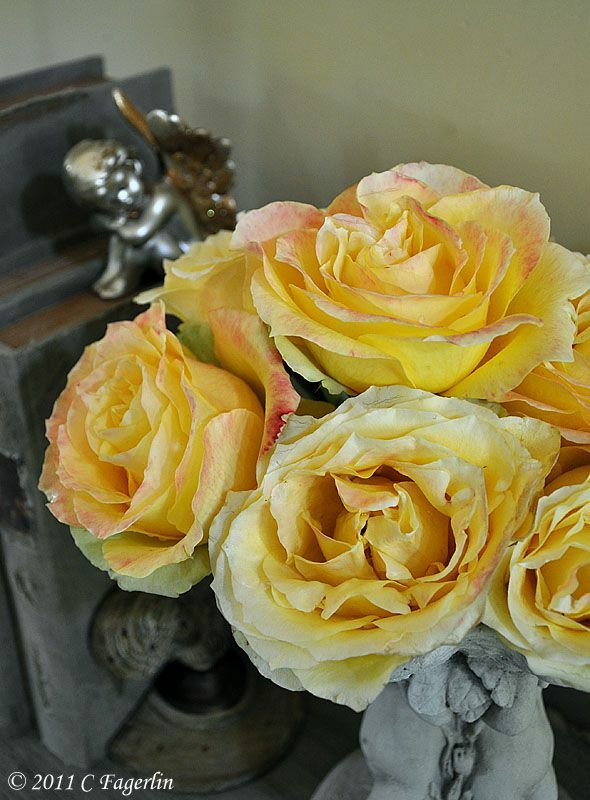 This St Patrick rose is a long lasting sturday rose that I just love. Because of our recent return to chilly temps the red tinges are more pronounced than its normal clear yellow with a tinge of green to the outermost petals. Beautiful roses, the colours are gorgeous. Love the cherubs too. Your photograph is beautiful.The fact that you grew the roses yourself only makes it more beautiful. I'm not a successful gardener or a successful photographer so I get a lot of enjoyment from seeing the success of others in these fields. Thanks ladies, I'm glad you enjoyed my roses, please come back again soon. this post and everything i see around here looks very artistic. what a skills you've got! Stunning roses. love that faint red tinge at the edge. Stunning shots. The roses are beautiful with their mixed colorations. 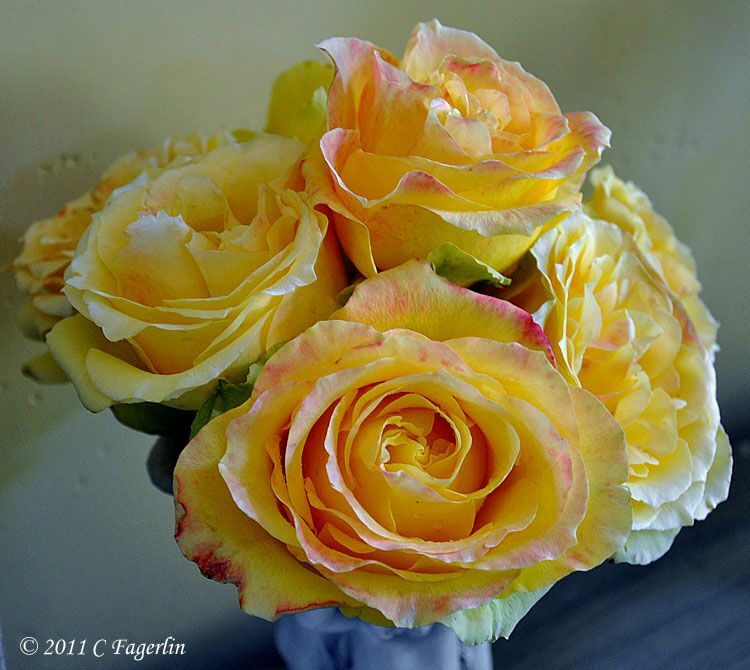 Yellow roses have always been my favorites, and this are lovely. Elegantly unfolding in just the right vase! Thanks for all your sweet comments! Please drop in again later today for some additional garden images.